One week a month, Watch This offers movie recommendations inspired by the week’s new releases or premieres. This week: Free State Of Jones looks back on the Civil War (no, not that one), so we look back on earlier Civil War movies. 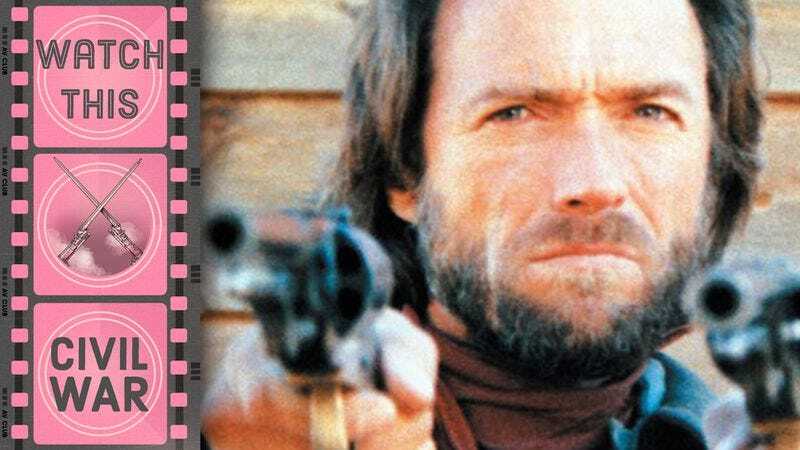 The Civil War ends at the outset of The Outlaw Josey Wales, but that doesn’t stop Missouri farmer turned desperado Josey Wales (Clint Eastwood) from continuing his conflict with the North in this superior revisionist Western from the legendary star. Achieving the mythic grandeur that he also strove for, and fell just shy of, with 1973’s High Plains Drifter and 1985’s Pale Rider, Eastwood’s classic marries the grand expressionistic flourishes of his spaghetti Western helmer Sergio Leone with his own more sober, straightforward aesthetics and attitude toward frontier brutality and survival. The result is a film that revels in the larger-than-life iconography of this hallowed American genre, even as it undercuts its romanticism—of tall men outfitted in wide-brimmed hats and gun belts, of horses galloping across the ragged plains, of squinty-eyed stare-downs and the fair maidens whose beauty makes them prey for marauding bandit—with a portrait of killing as a plague that begets individual and national trauma. Eastwood’s Wales is consumed with vengeance after his wife and son are murdered by a gang of renegade Union soldiers led by villainous “Redleg” Captain Terrill (Bill McKinney). Facially scarred and left for dead, Wales pulls his revolver out of his burned home’s ashes and becomes a fugitive hunted by Terrill, who deceived Wales’ pro-Confederate comrade Fletcher (John Vernon) into surrendering, only to slaughter his men in cold blood. While on the lam, Wales assumes the role of reluctant paternal guardian of numerous allies: Sam Bottoms’ wet-behind-the-ears soldier; Chief Dan George’s cagey old Cherokee; Geraldine Keams’ Navajo woman; and Sondra Locke and Paula Trueman’s native Kansans. Episodic in nature, The Outlaw Josey Wales is enhanced by tense juxtapositions of the intimate and the epic, never more so than through Eastwood’s editorial contrasts between widescreen panoramas and intense close-ups of faces and eyes. It’s an exhilarating, amusing, and altogether grand adventure about one man’s search for, and reclamation of, the humanity he’d lost—a process that involves much tobacco-juice-spitting, copious superhuman gunplay, and phenomenal one-liners (“Dying ain’t much of a living, boy”). Availability: The Outlaw Josey Wales is available on Blu-ray and DVD from Netflix or possibly your local video store or library. It can also be rented or purchased from the major digital services.